As your local MP too often I am the only woman at meetings about key decisions about the future of our community. That's why I'm asking you to join us celebrating Walthamstow's suffragette past to inspire a more equal future on International Women's daySaturday 8 March 2014 at midday in Walthamstow. The Museum of London has recently provided me with a photograph of women marshalling on Cedars Avenue in Walthamstow in 1910. Here's my recent Tedxtalk about why we need to recreate this spirit and inspire women into participation in community and civic activism. We want to do this by posing for a photograph to recreate the suffragette's picture, and then marching down to the Assembly Halls where Waltham Forest Women's Network Festival is holding an all day women only festival for IWD 2014. The march will form up around midday with an aim to get to the town hall complex by 2pm for the start of the festival. We want women and girls of all ages to join this march and celebrate - and men who share our ambitions to line the streets in support! We are also able to provide local schools and youth organisations with historical educational resources about this event. We would like to have banners and sashes for attendees - Significant Seams Craft Community Enterprise will be holding a session in the week before to make sashes and anyone else who can help with making banners or badges for those attending we would very much appreciate! 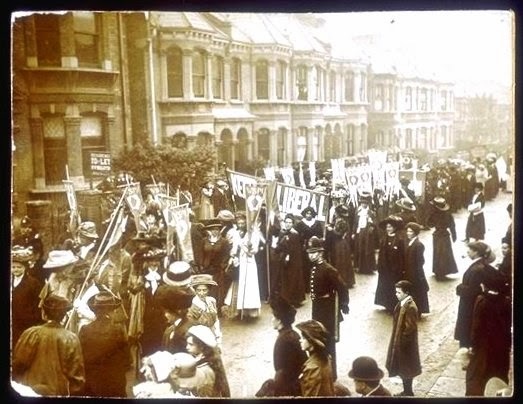 If you have other ideas for how to make this march a vibrant celebration of equality please do get in touch - I hope you will feel inspired to join us in showcasing the history and celebrating the futures of Walthamstow's women!